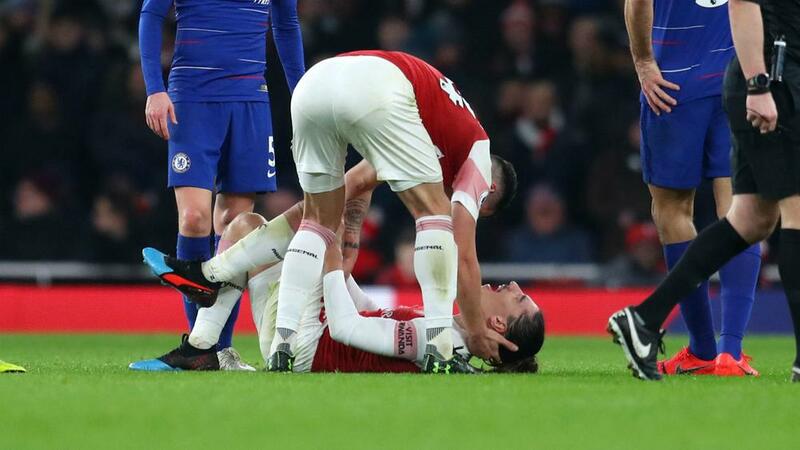 Arsenal head coach Unai Emery is fearful Hector Bellerin suffered a serious knee injury during the second half of Saturday's 2-0 Premier League win over Chelsea. The Spain right-back appeared to twist his left knee before falling to the Emirates Stadium turf and departed on a stretcher after 72 minutes. Bellerin was making his first start since suffering a calf strain in December and Emery is preparing himself for an even more lengthy spell without the 23-year-old. “We have to wait but, his knee, the first prediction is it can be an important injury," the former Sevilla boss told reporters. "I hope not, but first impressions are not positive." Ainsley Maitland-Niles – who had already been brought on for midfielder Aaron Ramsey – was redeployed to Bellerin's position, while Emery also brought in experienced defender Stephan Lichtsteiner during the close season. As such, he does not feel this setback needs to be addressed in the transfer market. "We have Ainsley, playing with good pieces. He played well [against Chelsea] and can help us," Emery added. "Also Lichtsteiner is another player who can play there. We have the players. Don't forget [Carl] Jenkinson, who has played some matches and can be used if we need him."